The Miner Football team will host a women’s clinic 6-7:30 p.m. Friday, Aug. 3, at Allgood-Bailey Stadium. Pre-game and post-game socials are optional. 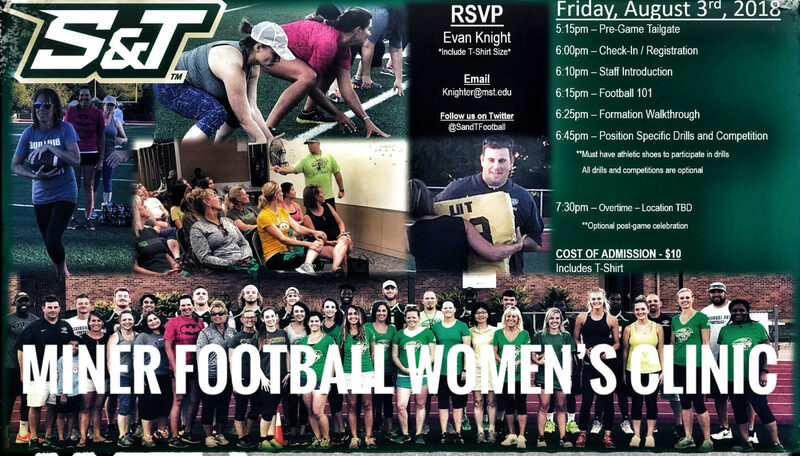 The clinic will include a “Football 101” session, a formation walkthrough with position-specific teaching, and football drills that the S&T football players run through daily. All drills are optional. Please wear tennis shoes to perform the drills. The camp costs $10 and participants receive a Miner Football shirt. RSVP to Evan Knight at knighter@mst.edu with your shirt size. All payment will be collected at check-in on Aug. 3.